In the spirit of the Lunar New Year, the Trapsmiths have crafted a fine homage to the ram! A finely-chiseled image of a ram's head resting upon an equally finely-crafted throne of horns. The Ram Shrine Crystal Laser Skin can be used on the Multi-Crystal Laser. The weapon's stats (power, power bonus, attraction bonus, etc.) are not changed. The Ram Shrine Crystal Laser Skin may be made available during the annual Lunar New Year event and can be traded on the Marketplace or through Give To Friends. 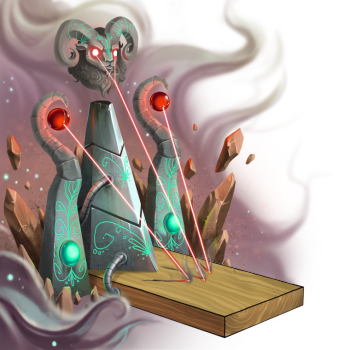 17 February 2015: The Ram Shrine Crystal Laser Skin was introduced with the Year of the Sheep Festival. 375 Cruise Bux (spent) and 1 Captain's Coat (not spent) were required for purchase. This page was last edited on 9 December 2017, at 14:35.